Rescue teams are dealing with the aftermath of severe flooding which has wreaked havoc across England and Wales. Families were forced to spend the night on the M5 while about 20 special needs children remain trapped in a school. Thousands slept in emergency centres. Sixteen severe flood warnings are still in place with more rain expected in the Midlands and north of England. Prime Minister Gordon Brown is having telephone calls with Cabinet colleagues to assess the government's response. Emergency services are taking the strain. The West Midlands Ambulance Service has made a plea for people not to call unless it is an emergency. And Hereford and Worcester Fire Service said it had received more than 2,000 calls in 27 hours. It has so far rescued more than 750 people who were stranded in cars, caravans, houses and boats. Children trapped at the Vale of Evesham Special School in Evesham look set to spend a second night there after police turned back parents attempting to reach them through the floodwaters. Congestion is reported at Heathrow airport and on many roads and rail services, on one of the busiest weekends of the year at the start on many school holidays. 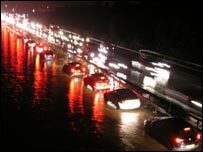 The Highways Agency said it did not expect congestion of the M5 to ease before Saturday afternoon. Many rail services have been cancelled, with no replacement bus service because roads have been closed. Gloucestershire, Warwickshire and Worcestershire are among the worst hit counties, with police warning holidaymakers against travel through Worcestershire and Herefordshire for at least 24 hours. The Environment Agency has issued 16 severe flood warnings, stretching from Lincolnshire to the Midlands and the Welsh borders. Parts of the Rivers Severn, Avon, Arrow, Dene, Tame, Great Ouse and Teme are affected. 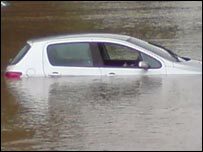 Head of the Environment Agency, Baroness Young, said there was a risk of more flooding in many areas, even where the rain had stopped. Around 70 homes and shops in Buckingham have been flooded following rising levels on the River Ouse. More than 2,500 sandbags have been used to try to limit the damage to property. The centre of Stratford-upon-Avon is under water and the Royal Shakespeare Company has been forced to close its Swan Theatre. The Wakestock Music Festival in north Wales has also been cancelled because of safety concerns. No wonder there's so much flooding. The roadside drains are simply not cleaned out until people actually complain to their councils. And John Kelly, Oxfordshire's county emergency planner, said passengers had been taken off trains in Oxford and Banbury and brought to Cherwell School in north Oxford, which had been turned into a rest centre. "We've ordered 150 sleeping bags from the Army... and some of my staff have gone down to the local Tesco to get things like towels, toothpaste and soap. "This is part of our plan, this is a thing we plan for, and we make arrangements for, but things always go wrong. "This is not the first choice of school, because the one we were going to had actually been flooded itself." One woman contacted the BBC to express her concerns over her family, who she said had been trapped on the M5 for several hours. WHAT CAUSED THE HEAVY RAIN? "My family including my elderly grandparents who are diabetic and my mother who also suffers from the condition have been stranded on the M5 for nine hours now with hardly any food or water," she said on Friday evening. A bus with 30 holidaymakers aged between 65 and 88 spent the night on the M5, after leaving Scarborough for South Wales at 0930 BST on Friday. After spending the night in his car on the M5, Simon Clarke said there was no anger among motorists but it was "not nice" because there were no facilities. BBC broadcast meteorologist Matt Taylor said there was a slim risk of torrential rain in the south and south east of England and that overall rain would remain heavy in the Midlands and north of England. He also warned that further flooding could occur as Friday's heavy rain continued to filter through the river system.